On a recent Friday, James Dreher was hard at work stirring dozens of pounds of ground beef with a small paddle. Dreher, like most people at Community Kitchen Pittsburgh in Hazelwood, is trying to turn his life around. He dropped out of school as a teenager when his mom became sick and started burglarizing houses. At 19, he was arrested for selling stolen goods, spent a week in jail and a year on probation. He’d worked as a janitor for six months, but he didn’t get along with his boss and was fired. It isn’t only that he lacks a formal education and has a criminal record at the age of 25, but he also hasn’t gained the skills to help him advance in the jobs he has gotten. That’s why Darryl Coaston, his trainer, peered over his shoulder to make sure the work was being done right before moving on to show one of Dreher’s classmates how to julienne an onion. 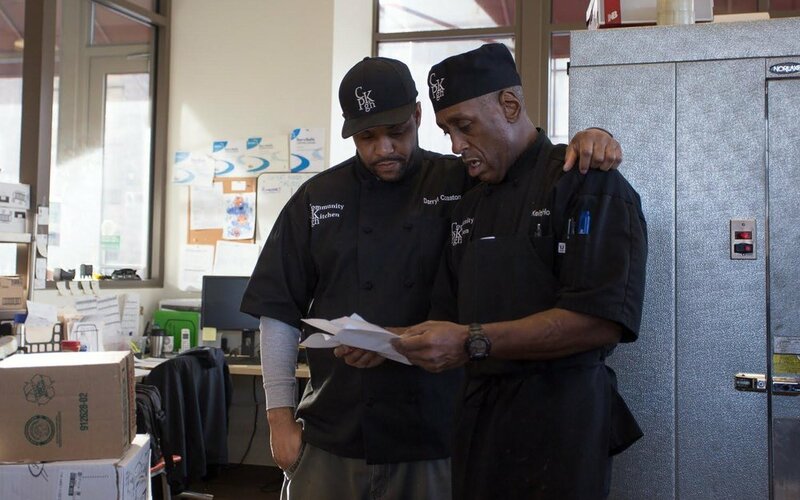 The Community Kitchen launched in 2013 as a “catalyst kitchen,” one of about 50 kitchens across the country focused on helping the disenfranchised integrate more effectively into communities and their workplaces. It takes people often with little or no kitchen skills who’ve had brushes with the law, drug addiction or trouble holding a steady job and trains them to become hirable cooks. The Community Kitchen caters, cooks for people experiencing homelessness and has contracts to provide food to five Pittsburgh-area schools. The tension between training its cooks and providing high-quality meals can create challenges, especially as the organization grows. The tension plays out in scenarios like when Coaston noticed one of Dreher’s classmates had accidentally dumped his beef into the sloppy joe sauce. So, while Coaston was showing the student his mistake, he also had to figure out how to make enough sloppy joes for the vegetarian students. But the Community Kitchen’s success doesn’t only depend on its ability to deliver lunches on time. The food is healthier than typical school lunches, and it has to find schools that can get kids to eat it. The meals the Environmental Charter School [ECS] receives from the Community Kitchen are part of the larger effort to change how students relate to food at school. The sloppy joes cooked at the Community Kitchen and served at the Environmental Charter School weren’t just any sloppy joes: they had been prepared from scratch. Most schools serve it frozen or from cans. ECS served the sloppy joe with both a fruit and a vegetable, while at many schools students only choose one or the other. And, instead of sugary chocolate milk, the school only served white milk. But just because the food is healthier, doesn’t mean all the kids are eager to eat it. More than half of the students in the cafeteria had brought their lunches from home rather than eat the sloppy joes, including a group of three sixth-graders, Elly, Emma and Carina. The only school meals they look forward to are pizza and calzones, they said. But for about a quarter of the students, who qualify for free and reduced-price meals, the school lunch is their default. The school hasn’t found any miraculous way to get kids to eat vegetables. While students happily ate scoops of canned tangerines with their sloppy joes, almost none of them touched the cauliflower. Niki Augustine, the school’s food service director, said other vegetables are more popular. The school tries to do tastings to introduce students to unfamiliar foods, but tastings take a lot of time and energy, and now that Community Kitchen is serving five schools instead of one, they don’t happen as frequently. But there were some signs that their menu might be changing attitudes. Ophelia Quashie, a new sixth grader at the school, said she was surprised the school didn’t have chocolate milk. After all the meals at Community Kitchen were cooked, the chefs-in-training met upstairs for a life skills class. While they are in the program, career services coordinator Robert Massey teaches them professional skills, like writing a resume. But most importantly, he said, he tries to figure out what has been preventing them from holding down a job. Massey, who along with his student, is black, tells the class about how often people in the black community don’t find help for their mental illnesses because of the stigma. After they graduate the 12-week program, Massey helps them find their first jobs. They typically will get early career jobs such as as prep cooks, he said. But one of the most recent trainees, Jen, said she just wanted to be a dishwasher. Even though she did well in the program, she didn’t want the stress that can come with cooking and the questions about her previous life that would inevitably follow. “The dishwasher is secluded,” Massey said. “And sometimes that’s what they need in order to further their progress." As the Community Kitchen expanded its school lunch program, it’s had to make compromises. The Environmental Charter School used to receive salads a couple of times per week as a side. But students at the Community Kitchen’s four other schools didn’t eat the salad. “So we lost that battle,” Augustine said. Salad was cut from the menu. The Community Kitchen gets about 70 percent of its funding from workforce development and school contracts. The school contracts provide real-world training for the cooks. And, Community Kitchen builds the school menus around meals that will teach the cooks basic cooking skills. But while the school lunches provide training opportunities, they also cost more to make than the Community Kitchen receives back from the schools. It needs more schools to break even. Jennifer Flanagan, the executive director of the Community Kitchen, said it costs the Community Kitchen around $3 to make each meal, while the school food conglomerates can provide pre-made meals for $2.25. That forces some schools to make tough choices between more expensive food, for example, and an additional cafeteria worker. “No one is setting out to serve terrible food; it’s just the last thing on the list after budget, teachers and instruction for many schools,” she said. “So we seek out schools that have the ability to pay attention to lunch." Flanagan has heard principals say they’re afraid to serve explicitly healthy food because it would be perceived as too political. So she tries to only work with schools that believe in healthy food enough to encourage kids to keep eating the lunch. That’s why Flanagan looks for schools like the Environmental Charter School, who are invested in serving healthy food and changing how students think about mealtime. When the sloppy joes from Community Kitchen were being served at the school, a debate broke out at a table of fourth-grade boys about whether dogs had been used in the Revolutionary War to sniff out mines. “The only hunting dogs I know in the Revolutionary War were woooolves,” one boy offered playfully. The discussion was going nowhere until a teacher, who was sitting across from them, set down her sloppy joe sandwich, pulled out her phone and read from Wikipedia: Dogs were used in the war to comfort soldiers, she read, but there was no mention of mines. The ECS teachers eat for free when they sit with students, so there are usually several scattered around the cafeteria. The inclusion of teachers into the lunchroom is one of the ways the school has tried to design a different kind of eating experience. They sit at mostly round tables with chairs rather than long benches. Each table has a pitcher of water on it, so a healthy drinking choice is nearby. After each of the four lunches is over, students are selected to take the waste away and sort it into recycling, compost and trash; others sweep and clean the tables or go into the kitchen to help do the dishes. Earlier on sloppy joe day, a class of eighth graders learned the same technique for keeping their fingers safe while chopping as was being taught to the chefs who prepared their lunch. The cooking class was taught by the head of the cafeteria, just another way that the school blurs the lines between lunch and learning. But it wasn’t always like this at the school: The students used to be so crammed into the basement during lunches that the teachers didn’t want to eat with them. And they served food from various restaurants, before the Community Kitchen came along.